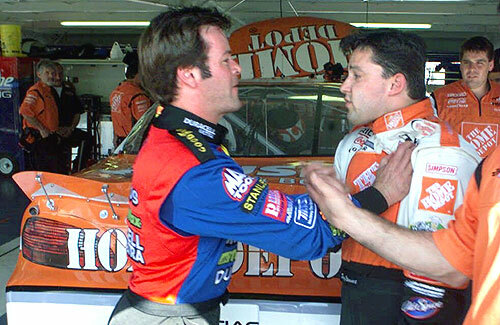 When dealing with a tempestuous fellow like Robby Gordon, you never know what he really means. It seems Robby - who long ago made the move to stock cars along with Tony Stewart, although with distinctly different results - has not only been talking of trying to do "the double" of the Indy 500 and the Soda Pop 600 this year, but now is so frustrated with a penalty he may just leave tin tops altogether. If the commission upholds the point penalties, Gordon will remain in 37th place in the owners standings, significant in that only the top 35 are locked into the field for each Cup race. Should the point penalty be rescinded, Gordon would be 21st in owner points. Gordon indicated Tuesday during testing at Phoenix International Raceway that the loss of his appeal might drive him to the reunified IndyCar Series. Gordon said he could field his own car in the open-wheel series. I may be wrong here, but I believe Mr Gordon's sister is known to be a close personal friend of Ryan Hunter-Reay, so much so that there was talk of Gordon starting an ICS team with Ryan last year before he was quickly hired for the Ethanol ride. So while this may be belly-aching on the part of the Gordon not named Jeff it's not entirely out of the realm of the possible. Would the basket of freebies offer extend to N-Word refugees as well? Huh. A series with Paul Tracy AND Robby Gordon? What's next, Vince McMahon and Gorilla Monsoon calling the races? Hey, if he wants to jump over, more power to him. I can see the dream promotion now for Eddie Gossage: Paul Tracy, Robby Gordon, Dan Wheldon and Danica Patrick in a Winner-Take-All-Death-Cage-Match in the middle of the infield at TMS! Let N-word keep shooting penalties in their collective foots. Their loss is our gain. N-word is as random in its rule enforcements as the NCAA under the tragic leadership of NCAA President Myles Brand. For the life of me, I never have understood why N-crap has to have "competition yellow's" ... What the h*ll is that about?? That "ain't" racing! Not related but important question: What is KEVIN KALKHOVEN title with the IRL? Tony's newest bestest buddy? I think this very important for the future of real racing. I think the competition yellow is used only on hot (temp) tracks, where tire wear has been an issue during practice. They have a single caution, early in the race, so teams can check tire wear. You may not like it, but if it keeps a couple of guys from driving into a wall at 180+, then it's not all bad. Of all the things to dislike about NASCAR as currently presented, that's a pretty small nit to pick. But at least I know why competition yellows exist....so my day isn't all bad. Wait, did I get it wrong? I thought that was what competition cautions were for. Would love to see him FIT in an Indy Car....gentelman start the buffet....please. The tire wear issue is the reason for competition yellows. You have that 100% right. As far as NASCAR and the penalty situation, I'd look for Robby's points to get reinstated today. Upholding that penalty will have a chilling effect on more than just the wily Mr. Gordon and only heighten the tensions between the manufacturer's and the sanctioning body. Good point on the tensions between teams (and manusponsors) and NASCAR. NASCAR really is in a bind with the whole "back to our roots" thing. If they don't go far enough, hard-core fans will feel like they're being patronized, while if they go all the way, they'll lose viewers. Honestly, the best thing for them long-term, in my opinion, is to accept that they've peaked, and focus on a real, meaningful return to their roots, but in a way that can maintain SOME of the expansion they've done. They'll lose California, and maybe the southwest, but will keep some influence in the midwest, and keep SOME of the southwest. They can accept that IndyCar is likely to regain SOME marketshare, and use the ISC ties to profit from Indy's ascendence. This will never happen, mind you, but it makes some sense. Though then again, their ratings are back up over last year's "dropoff." So who knows? remember that whole "danica only weighs 100 pounds" thing? If I'm Tony George (and I'm not), I'm offering the same incentives to any new teams coming from other top tier series. Imagine the positive press (or at least the effective countering of negative press) if/when N-word drivers/teams start flowing in the other direction. These are magical time we're living in boys. Yeah, those are good thoughts, but the ratings uptick may be weather and start time related. And they weren't Earth shattering We're going to have to see 50% of the season to really know. Also, ratings are up because Dale Jr. is in a car where a win is possible. Don't think that effects ratings? Check out last year's Chase. As far as getting the core fans back, it's not going to be anything NASCAR does, it'll be the economic contraction of the series that does it. With less on the line and less corpwhroate types running things, drivers can return to being themselves and they may gain some of their endearing "everyman" quality back. What is KEVIN KALKHOVEN title with the IRL? Tony's newest bestest buddy? Tha position has been taken by Robin Miller. Someone please print off some Bring Robby home to the IRL t-shirts. I want him back you never know with Robby. He's been hit with big penaltys that threaten to keep him out of the top 35 in points! No time like the present for him to come back! Robby and his sponsers would get more pub. from leaving n-word than the last 4 years of him racing there. Alright has everyone heard yet? Robby got his points back but still has a fine to pay. In fact the fine got higher. He's back inside the top 35, Indy may not be happening. Fine will be paid by Dodge, since they made the mistake. RHR is dating/engaged to Robby Gordon's sister. Looks like N-Word didn't want to lose one of their best personalities. I tried not to get my hopes up, but I'll echo what's been mentioned already: I would love to see him back in open wheel. I'm sure they'll do their best not to have any of their drivers defect to IndyCar. They are already stealing more than just our drivers. I love how they take credit for the SAFER barrier and the "gopher cam". IMS has had the ground cam for years. Right now, with as much (justified or otherwise) super warm happy feely buzz that the press is giving the new ICS, I'd love to see what limits NASCAR will attempt to go to either steal the spotlight or at least interrupt its beam for a few minutes. NASCAR might make a few swipes at IndyCar, but I really do think the timing is good, in that NASCAR has a whole host of issues it has to address sooner rather than later. An IndyCar series that might at some point be sort of a threat isn't a big enough problem, yet. Yet. It's not a problem in the fact it is direct competition yet per se, but it is a problem in the fact it's hogging media time from them, something they desperately need right now to right the sponsorship issues. One final word on this. I don't want it to sound like fanboy wishful thinking because it's not, but should he remain in the Top 35 until the end of the season, Robby could ostensibly sell off his suddenly very desirable team and and still come back to a more personally profitable gig in the ICS anyway.